ISO files are basically archive files that represent the contents written in every sector of an optical disk. This way you can have a CD or DVD image handy any time in your hard drive and use it accordingly (either mount it to access the data, or burn it on an actual physical disk). Linux users are very font of ISO files as this is the most common format that Linux distributions come in. You can use them as local repositories/media to update or enrich your existing distribution, install them on a virtual machine for testing purposes, or just burn them on a CD/DVD and use it as an installation and system recovery disk. There are many ways you can follow to mount or burn an ISO file in Linux and as you probably already guessed, the Terminal and the 'mount' command is the most direct of all. This post won't deal with this though, as there are other more user-friendly ways to deal with ISO files like the Acetone and Furius GUI tools. Acetone ISO is an Italian piece of free software which specializes in the handling of ISO files. It offers advanced features to help you manage CD/DVD images of various formats like ISO, BIN, NRG, MDF and IMG. While Acetone is quite rich in features, it remains simple to use even when you want to do things like md5 calculation checking, create an ISO from a PlayStation game, or convert your image file to another format! All is just a few mouse clicks away. As shown in the first screenshot, Acetone can seamlessly work under any of the popular user environments and their respective tools like file managers, media players etc. When you launch Acetone for the first time, you are given the opportunity to select your desired default applications to be used by the tool when such action is required. Acetone can prove very valuable when your tasks are related to video files. It can play DVD images using the chosen media player, extract audio tracks from a video and even download YouTube and MetaCafe videos. Additionally, you can convert between AVI, FLV, Xvid and PSP video. Of course, Acetone can also burn image files to physical optical disks using external applications and even open and utilize torrent files that you can manage right from the main window of the application. The tabbed design of the interface is handy, but the specialized tools could be categorized in a better way, instead of being placed in vague menus. It generally looks and works good, but the interface design wouldn't be hurt from some modernization. If you want a much simpler but similarly effective tool (for basic functionality) you can give Furius a try instead. 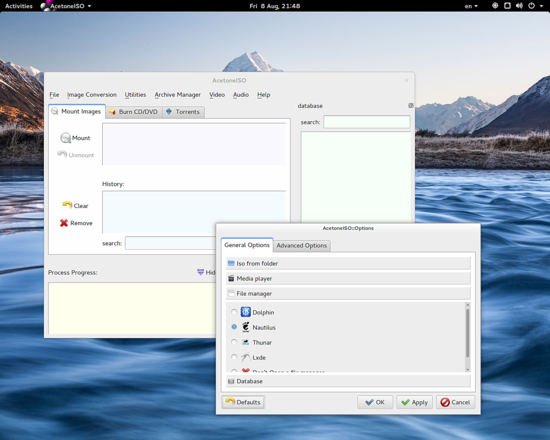 Furious is a GTK 2 ISO mounting and burning tool that can also check Md5 and SHA sums. It is much more simplistic than Acetone, but it remains a simple to use tool that does the job fast and without issues. It also supports other image formats besides ISO like IMG, BIN, MDF and NRG. While Furius uses an anachronistic version of the popular toolkit, its interface looks much more structured and coherent in contrast with Acetone's. It could of course use GTK3 and integrate some notifications for popular environments like GS, Unity and KDE to become more relevant to the times, but it works well as is anyway. Are any ad-hoc applications necessary to deal with ISO files? I mean, is the mount command not enough?